United States. New Brunswick, Nova Scotia etc. A fine 1830 map of the United States and Canada by Charles Smith and Sons. 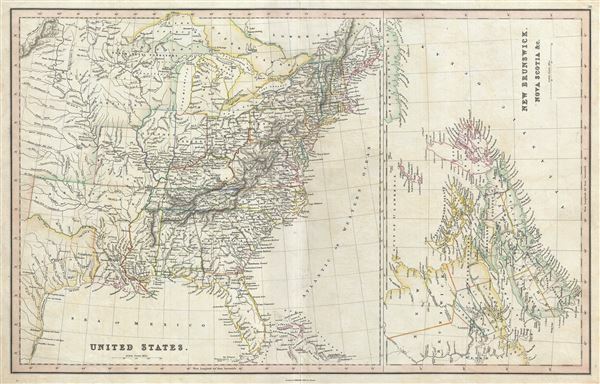 Essentially two maps on the same sheet, the map on the left depicts United States as it existed in 1830, including the Missouri Territory, Arkansas Territory (spelled 'Arkansaw'), and Texas. It identifies rivers, mountain ranges, lakes, and major cities. Territories are defined by outline color. Virginia and West Virginia have yet to split. Texas is part of Mexico. The Missouri Territories extend westward off the map. The map on the right covers the Canadian Maritime Provinces, including New Brunswick, Prince Edward Island and Nova Scotia. Canadian provinces and territories were under British and French control from the 16th century, until France gave up its claims in the Treaty of Paris in 1763. Canada would remain a collection of British colonies until its confederation in 1867, when the British colonies of New Brunswick and Nova Scotia would become Canadian provinces along with Ontario and Quebec. Nova Scotia would become the first British colony to adopt representative government in 1848. Although known as the 'Birthplace of Confederation,' Prince Edward Island would only join the confederation in 1873. This map was issued by Charles Smith and Sons in 1830. Charles Smith (1768 - 1854) was 19th century British publisher of maps, atlases, and charts, most of which focused on England and London. Smith was appointed mapseller to the Prince of Wales in 1809. His early work stylistically resembles the work of Pinkerton, Cary, and Thomson, though on a much smaller scale. From 1826 to 1854 the business traded as Charles Smith and Son. After Charles Smith's death in 1852 the it was taken over by his son who continued to publish maps well into the 20th century. The younger Smith is best known for his introduction of the 'Tape Indicator Map'. This map, which came with a tape measure, enabled users to triangulate their location based coordinates given in an attached guide. The firm was taken over by George Philip in 1916. Very good. Overall age toning. Minor wear and verso repair along original centerfold.